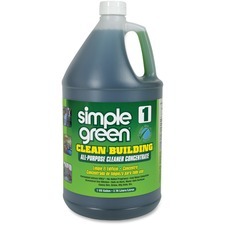 The nontoxic, all-purpose cleaner removes dirt, grime and oily soils without heavy scrubbing. Strong surfactants penetrate and then lift and remove soils, rinsing cleanly for a streak-free, smudge-free shine. The concentrated formula dilutes at 1:64 for great value. It meets the Green Seal GS-37 Standard, including reduced health, safety and environmental impact of formulations as well as product efficacy requirements. It also complies with LEED green building requirements and environmentally preferable product purchasing programs in place throughout federal, state and municipal governments.